Load cells are a special variant of force sensors. The load is measured in grams, kilograms or tons and not in newton like "normal" force sensors. We offer load cells in different designs and sizes: Single point load cells, compressive load cells, ten­sile & compressive load cells, as well as bending beam and shear force load cells. In addition, our product range includes a comprehensive selection of installation kits, accessories and scale elec­tron­ics. Pendulum load cells (self-restoring column load cells) are designed for very high load ratings. Typical applications include industrial high-per­for­mance scales, truck and rail scales or tank and silo scales. The use of tensile and compression load cells is versatilely. However, they are mostly deployed for weighing suspended loads. 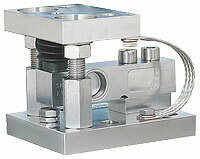 S-type load cells (or S-shaped load cells) are particularly suitable. These load cells can achieve optimal transmission of force through their central internal thread (with hinge and mounting suspension, if necessary). Typical applications are suspended load carriers, tank and hopper scales, crane scales or weighing bands. Shear force and bending beam load cells are ideal for the use in harsh en­vironment and Ex-range in general, due to their high level of protection and ATEX certification. Relatively small forces cause high strains at bending beam load cells. Thus, mechanical boundaries (overload protection) can be realized very easily. Shear beam load cells, however, are stable against lateral forces and less sensitive to the load point. Typical applications are high-precision dosers, fill level control, tank and hopper scales or belt scales. Assembly kits (mounting kits or weighing modules) must be designed to protect the load cell from lateral forces, bending and torque, vibration and eccentric load transmissions. By this, the assembly is considerably fa­cili­tat­ed. Just mount the kit below the load foot of the tank (silos ..) and the sys­tem is ready for use. 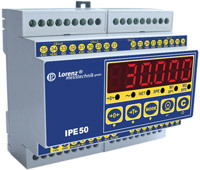 Our scale electronic portfolio ranges from a relatively simple junction box to a high resolution digital weight indicator with remote control for up to 8 load cells.